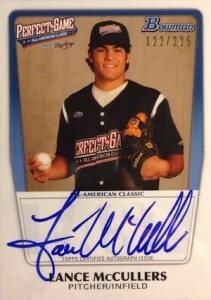 Bowman AFLAC autographs hold a special place for many in modern collecting. The autographed insert set features on-card signatures and honors elite high school players who have participated in the annual AFLAC All-American Game. While it is not the only all-star game for high school baseball players, it is generally regarded as the top option for elite baseball talent. The biggest appeal is that it gives collectors the first shot, at least in theory, of obtaining cards from top players that are signed even before they are drafted. The invitation-only event includes players who are normally in their senior year of high school. It is important to note that the official name changed from the AFLAC All-American Game to the Perfect Game All-American Classic Presented By Rawlings, starting with 2011, but many still refer to the game and the resulting cards by the original name. 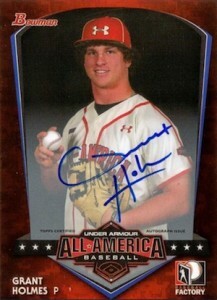 Additionally, players from the the Under Armour All-America Game, a high school all-star game organized by Baseball Factory, have been included with the AFLAC autographs in recent years. Both Perfect Game and Baseball Factory count plenty of current MLB players as former participants in their respective games. Full lists of MLB alumni for Baseball Factory and Perfect Game can be seen by following the links. Despite, or perhaps due to the popularity of these cards, several elements contribute to the confusion and the opportunity for forgeries. First, the cards are printed at the event and unsigned cards are distributed at these events to both players and fans. Also, not all of the pack-pulled cards include serial numbering, which makes it easier to determine which cards were certified by Topps, versus those that were signed in-person or simply forged. Because these players are still amateurs at the time of the signing, Topps must hold the autographed cards until the player is drafted and signs a contract with Topps. Therefore, years may pass before the cards for particular players are found in packs, especially if the player attends college for several years. Take a look at the card designs which have featured through the years below. Please note that while there are other AFLAC designs that have been used in other years, this guide only covers the autographed cards issued by Topps in their products. The following tab includes full checklists from all products that released these cards, including full print runs and any other notable information. The following list documents each edition of AFLAC Autographs, including basic information and a full checklist. 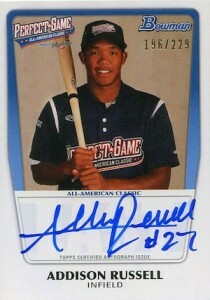 The card design and all-star game year are noted for each player. Click the main set listings to shop singles from each product. Detailed product information can be seen by clicking the product link in the body of the text. 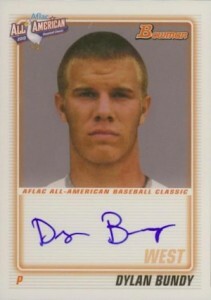 The very first edition of the AFLAC autographs came from 2004 Bowman Draft as the result of an error. Basically, Topps made too many redemptions cards for the Gold Refractor (#/50) parallel, and collectors were offered a set of signed AFLAC cards as a replacement. Despite carrying a 2004 label and design, the cards were not shipped until 2006. Each card is numbered to 125 and the Andrew McCutchen and Justin Upton cards are very valuable. All four players participated in the 2004 AFLAC All-American Classic. 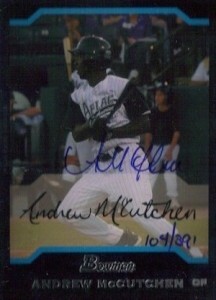 Further complicating things, Topps released 2006 Bowman Originals, which included base buyback versions of the 2004 AFLAC cards that were signed and hand numbered. Many of the signed AFLAC cards that are found for Upton and McCutchen are this version and collectors should be aware of the differences. 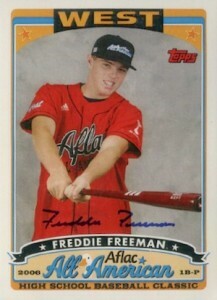 Although the base AFLAC cards were included in Bowman Draft Picks & Prospects every year, starting in 2004, there would not be live AFLAC autographs until 2008 Bowman Draft. The 20 pack-pulled cards are not serially numbered, which can make purchasing these cards a dicey proposition. Professionally graded cards are the safest bet when talking about the 2008 Bowman AFLAC autographs. 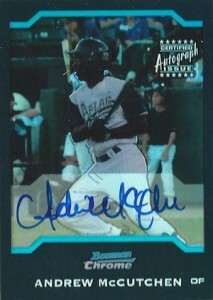 Much to the delight of collectors, the AFLAC autographs found in 2009 Bowman Draft Picks & Prospects packs were numbered. The numbering is inconsistent, but all 13 cards are limited to 248 copies or less. Again in 2010, the AFLAC autographs were numbered. The big inclusion in the 2010 release is Bryce Harper. 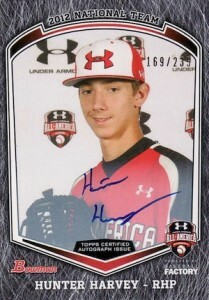 Harper participated in the 2009 AFLAC All-American High School Baseball Classic and autographed cards, some even featuring authentic-looking holograms, soon surfaced. While there are likely many versions signed in person by Harper, no official Bowman AFLAC Bryce Harper autograph cards were released by Topps until 2010, and they are numbered to 230. 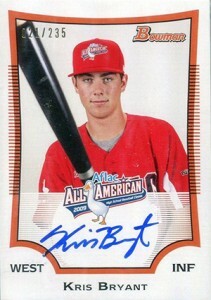 2010 Bowman Draft Picks & Prospects also featured the largest checklist to date, with 25 cards. Collectors were not impressed when Topps decided to issue the 2011 Bowman Draft Picks & Prospects AFLAC Autographs without serial numbering. 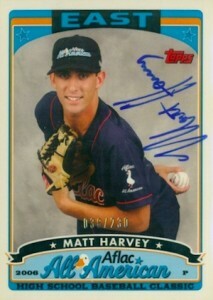 An outcry resulted and Topps elected to offer free grading for any AFLAC card pulled in 2011 Bowman Draft. The cards are pulled 1:1,036 hobby packs, on average, and all seven cards include players from the 2010 AFLAC All-American Classic. 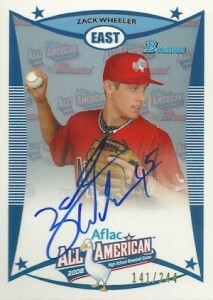 2012 Bowman Baseball marked the first time that the AFLAC autographs were found outside of the Bowman Draft brand. The 11 autographed cards were included as an additional hit and only found in hobby packs. 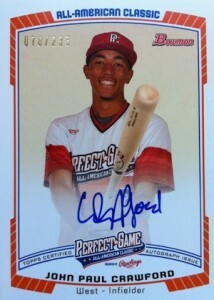 2012 Bowman Draft Picks & Prospects Baseball marked the first time the checklist included multiple all-star games, including AFLAC/Perfect Game and Under Armour. This edition sees a return to the serial numbering that collectors prefer. A complete guide to all 15 autographs can be viewed here. 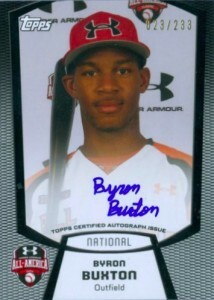 Continuing what 2012 Bowman Baseball started, 2013 Bowman Baseball again included high school all-star game autographs. The set covers players from both the 2011 Under Armour and Perfect Game events. All ten cards are numbered to 225. 2013 Bowman Draft Picks & Prospects includes a new crop of young players, mainly from the 2012 games. Kris Bryant looks to be the biggest draw for collectors. 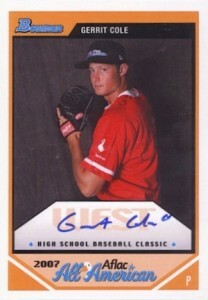 Some of the Perfect Game players, like Gosuke Katoh, Reese McGuire and Ian Clarkin, also have red-ink parallels, numbered to 10. Although he was listed on the checklist, Hunter Green's cards were apparently not released. Collectors will see a lot of familiar All-American faces in 2014 Bowman Baseball. Carrying a lot of the same names from 2013 Bowman Draft, many of the those included from the 2012 Under Armour roster are now seen from their 2012 Perfect Game appearance. All 15 cards are numbered to 235. 2014 Bowman Chrome offers ten more cards, with the biggest name being Javier Baez. The majority of the cards are numbered to 225, but the Baez cards is numbered to 200. Ten more cards are included in 2015 Bowman, with the majority from players that participated in 2013 events. Each player has 200 cards and Alex Jackson is the biggest current draw for collectors. It is important to note that many in this group played in both 2013 games, so the players have unsigned cards from Under Armour and Perfect Game. The list below provides a real-time look at the 20 most-watched Bowman AFLAC autograph cards currently available on eBay. The list is constantly updating to give collectors the most accurate picture of the most popular cards on eBay.